Here is my yummy poke bowl with tasty and crunchy popcorn shrimp! In a large pan on medium heat, add the ½ cup of vegetable oil. In another bowl, add the breadcrumbs, the panko, the parmesan cheese and the salt. In a third bowl, add the 2 eggs lightly beaten. As a 3-step process, dip the shrimp in the flour, then in the egg and then in the breadcrumb mix. Add the shrimp to the pan and cook for 3 minutes on both sides, or until the shrimp is cooked and golden brown. In a small bowl, stir in all the ingredients until well combined. Set aside. Cook the rice according to the packet. Cut the carrot in julienne. Steam the carrot, the corn and the edamame for 6 to 7 minutes. 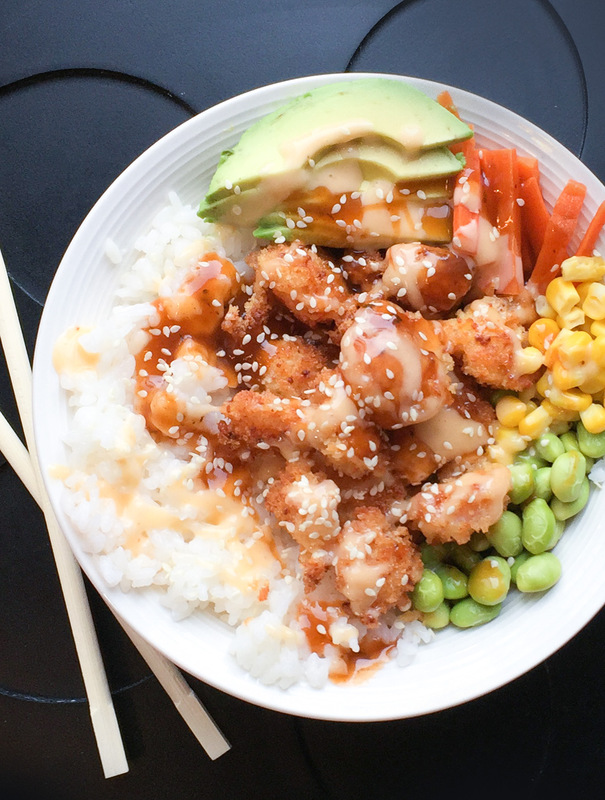 Create your poke bowl by adding the rice, then the vegetables and then the popcorn shrimps. Drizzle with the sauce and top with sesame seeds. To be more efficient began by cooking the rice and follow with the other steps. This recipe is suitable for pregnant women or even for people that dislike raw fish!